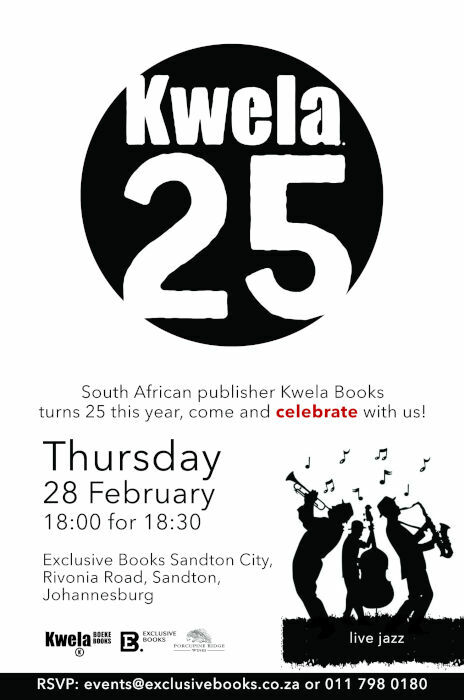 Kwela Books is celebrating 25 years of local publishing this year, and will be hosting an event at Exclusive Books to celebrate. Cape Town-based publisher Kwela Books is celebrating a quarter century of publishing books from Africa for Africa, from March to November 2019. The campaign, which kicks off with a party at Exclusive Books in Sandton on 28 February, includes a nine-month promotional programme featuring 100 past and present Kwela titles at participating bookstores countrywide. Founded in 1994, with the advent of democracy, Kwela’s vision was to give a new generation of authors a voice and to document untold, uniquely South African stories. With the demise of apartheid, it not only became possible for writers of all races to express themselves freely for the first time, there were also many stories by talented authors waiting to be told. Kwela helped introduce these stories and authors, many of them now household names, to readers in South Africa and across the world. Today, Kwela continues this legacy by producing English and Afrikaans fiction and non-fiction reflecting a contemporary South Africa with relevant local content that continues to resonate with readers. The anniversary programme will be rolled out on a monthly basis in collaboration with local booksellers, with the titles grouped according to author, genre or theme. The Kwela Library, promoting 100 titles and 70 authors, is an eclectic list of established and new voices. One lucky reader attending the Sandton launch will also win his or her own Kwela Library. On the fiction side, the promotional list includes titles ranging from Kwela’s very first publication, Vatmaar by AHM Scholtz, and a reprint of Nthikeng Mohlele’s seminal novella A Scent of Bliss, to Ekow Duker’s latest novel, a collection of short stories by Fred Khumalo and a new novel by Tracey Farren. Profiled authors include Niq Mhlongo, Nozizwe Cynthia Jele, K Sello Duiker and Finuala Dowling. Poetry will also feature, with volumes by poets including Adam Small, Rustum Kozain, Gabeba Baderoon and Keorapetse Kgositsile. Non-fiction includes recent publishing highlights such as Poacher by Shuhood Abader and Kimon de Greef, Feminism Is, a collection of feminist writing from South Africa edited by Jen Thorpe, You Have to be Gay to Know God by Siya Khumalo, the Pocket Revolutionary series, as well as new titles to be introduced during the year. Since 1994, Kwela Books has introduced readers to works by novelists, short story writers and poets such as Achmat Dangor (whose Bitter Fruit was the first novel published in South Africa to be shortlisted for the Man Booker Prize), K Sello Duiker, Zakes Mda, Kgebetli Moele, Sifiso Mzobe, Niq Mhlongo, Nozizwe Cynthia Jele, Zukiswa Wanner, Rayda Jacobs, Maxine Case, Ronelda Kamfer, Nathan Trantraal and Anchien Troskie – to mention but a few. ‘It is a privilege to be part of an imprint with such a rich history in South African literature and to build on that legacy by continuing to publish excellent writing by a diversity of voices,’ says Carolyn Meads, fiction publisher at Kwela. On the non-fiction side, authors of biographies, autobiographies and current affairs titles have included the likes of Zubeida Jaffer, Richard Stengel, Es’kia Mphahlele, Fatima Meer and Linda Fortune. Kwela also publishes the Pocket Revolutionary series focusing on political thinkers and their work, ranging from speeches, essays and interviews to rare writings. Titles have included the words and thoughts of Nelson Mandela, Oliver Tambo, Anton Lembede, Govan Mbeki, Helen Joseph and Victor Selope Thema. The series, which brings South Africa’s best thinkers from the past into contemporary conversation, is continuously being expanded. ‘Kwela is honoured to promote relevant South African literature and we’re so proud of how the brand has evolved over the years. We’re thankful for loyal readers and authors who’ve made our Kwela community that much stronger,’ says Na’eemah Masoet, publisher of Kwela non-fiction. Kwela authors are read around the globe – in addition to Europe, Great Britain, Scandinavia and the USA, also in countries such as China, Russia, Egypt, Thailand, Greece, Lithuania and Slovenia. International rights have been sold of 23 authors’ work – 36 titles in total. Some Kwela titles have also been adapted for the big screen. Films released to critical acclaim and success at the box office have included Dis ek, Anna, based on two novels by Anchien Troskie about the devastating consequences of child sexual abuse, and Happiness is a Four-letter Word, a romantic drama based on Nozizwe Cynthia Jele’s novel of the same name. More recently, film rights or options have been granted for Die tragiese saak van Pamina Vermaak by Annie Klopper, Young Blood by Sifiso Mzobe and AmaZulu by Walton Golightly.